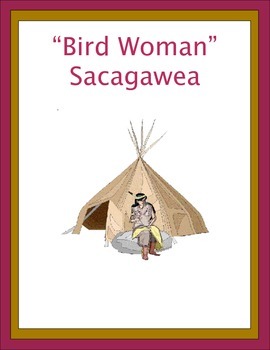 This is a very interesting unit about and Indian woman who traveled with the Corps of Discovery headed by Lewis and Clark. The story of her capture, how she worked as a slave, and how she helped the expedition. 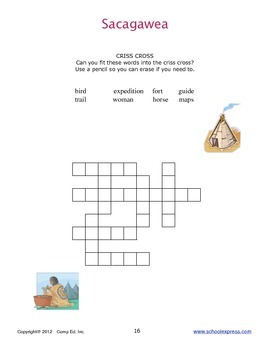 The unit includes worksheets: fill in the blank, criss cross, and word find. We off 200+ Thematic Units. They can be purchased individually for $2.00 each or they can be purchased in bundles. The bundle price offers the units for 40¢ or less per unit. The Bundles of Thematic units are new, just added on 3/20/16. They previously have only been sold individually. Below are the titles offered in each bundle. View the preview file to learn more about the units. 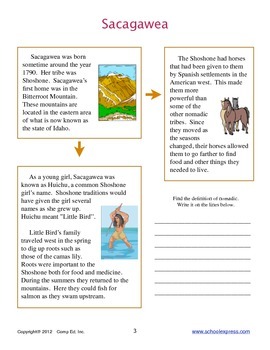 This bundle offers a thematic unit for each of the 50 states and one for Washington DC.